Theresa's Mixed Nuts: Escaping The Winter With Castaway Bay! Escaping The Winter With Castaway Bay! Like most areas, winter has been brutal here. I have been having dreams of sunshine, warm weather, and sitting poolside watching my kids splash and play. Looking out my window at all the snow piled sky high, those dreams seem very far off. 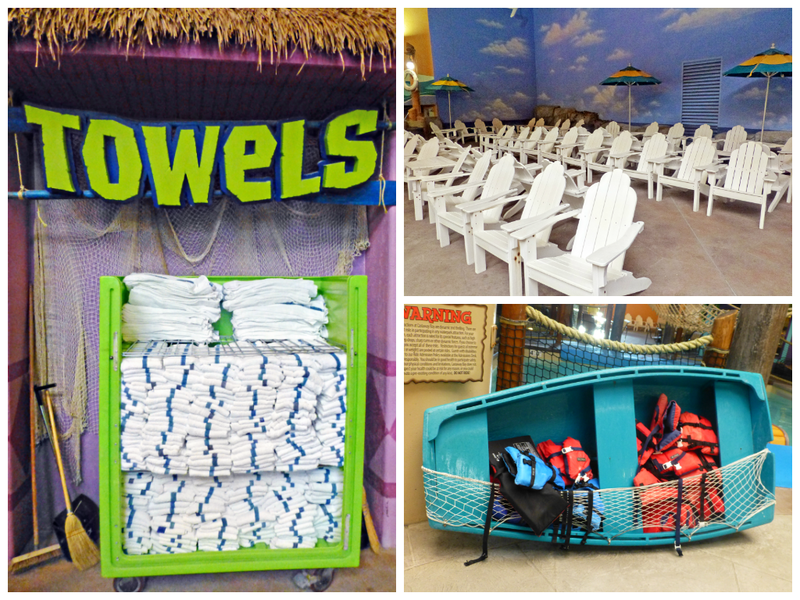 So, when I got an invitation to a mom blogger event at Castaway Bay's Indoor Water Park and Resort, I couldn't pack our bags fast enough! 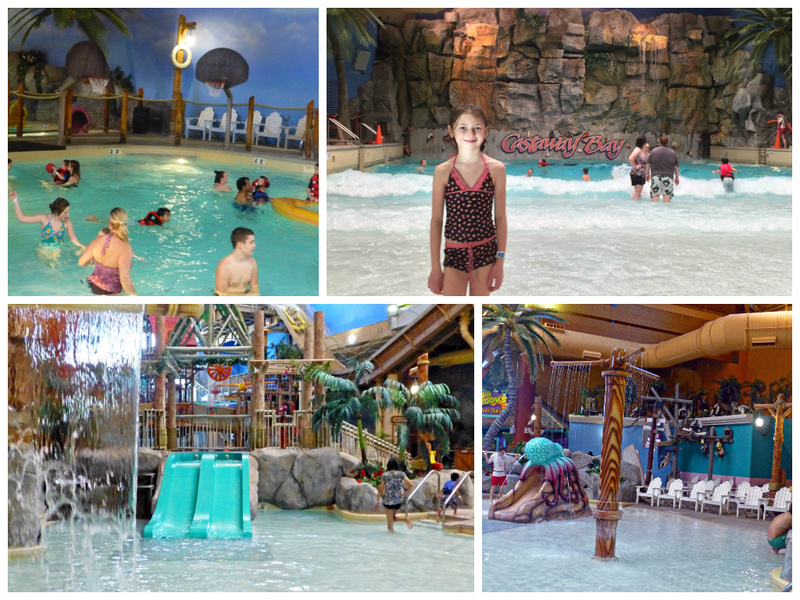 Castaway Bay is a family friendly water park and hotel located in Sandusky, OH. Offering tons of fun for the whole family, and temperatures at 82 degrees, you'll feel like you are on a tropical vacation, even if the temps are still below zero outside. As soon as we arrived, we couldn't wait to grab our wristbands and head to the water area. Not only did it feel heavenly temperature wise, the first thing I noticed was the fun atmosphere. Bright colors, palm trees, and tropical decor all catch the eye. The first thing my girls were excited to try out was the wave pool. They waded around in the still water until the waves started up, then had fun bobbing around on them. What I loved about it was the waves weren't over powering. I have been to other wave pools where the force is so strong, other swimmers are slamming right into you. That will NOT happen at Castaway Bay! We then walked around exploring the other areas. Located close to the wave pool was a kiddie area. While my girls bypassed it, I thought it was set up very well. Short slides and a little water fall make for fun play with the little ones. We did have a lot of fun playing basketball with the 4 hoops set up in the pool area. 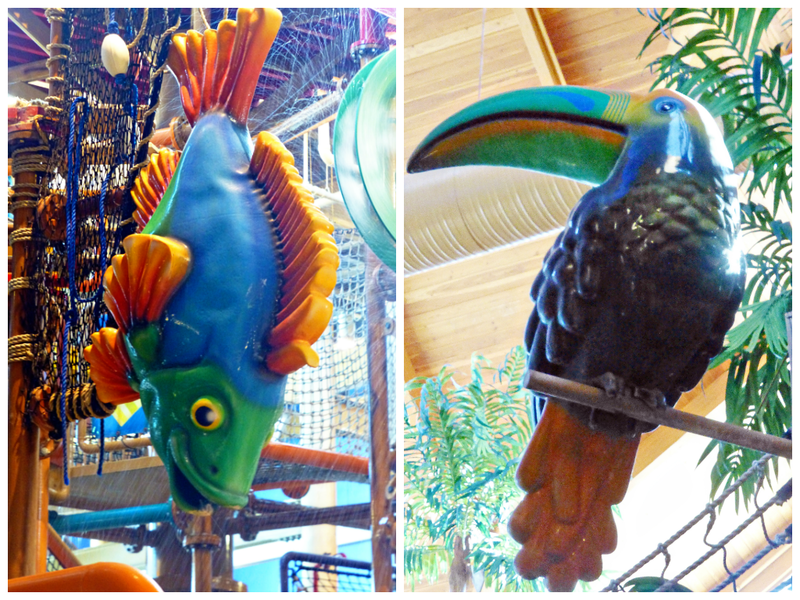 Also in the pool area, you will find colorful animals to climb and play on. The snake was a definite favorite! The hot tub area is a wonderful place to relax. With warm temps and cascading waterfalls, I didn't want to get out! If you walk through the hot tub, you come across a door that leads you straight outside to an even bigger hot tub area. There's nothing quite like sitting outside surrounded by snow, but still being warm and cozy! The rope walk was quite the challenge, and only Allison made it across without difficulites. Both girls had a lot of fun getting splashed by the huge dumping bucket! The highlight is the water slides though! Allison had us riding the Rendezvous Run over and over again, but by the end of the day she was riding it all by herself like a pro! I was pleased to see there were plenty of lifeguards at each station, and they had everything organized and running smoothly. I also loved that they had plenty of life vests available, more than enough seating, and even had towels available for the guests. If you find yourself in need of refreshments, you don't even have to leave the water park! Stop over at Big Daddy's Snack Shack for a beer or a bite to eat. The only complaint we had was at Big Daddy's. We don't carry our wallets into the water park, so we would have loved it our wristbands were set up to charge the bill to our room. Other than that, the food was great, and everything was reasonably priced. 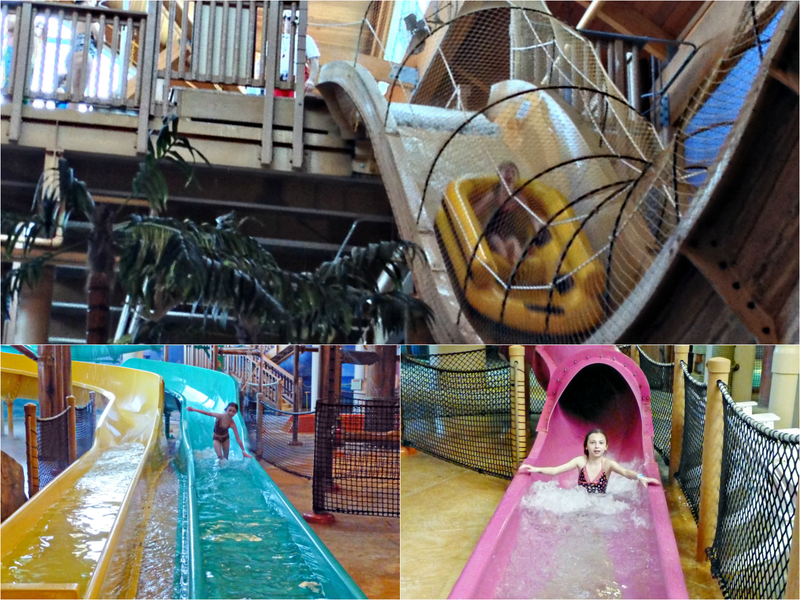 The water park isn't the only fun you can have at Castaway Bay! Be sure to stop back tomorrow to see all of the other great activities that are offered for you and your family to enjoy! Also, I will have a very special giveaway going up for some Free Day Passes! You won't want to miss that! 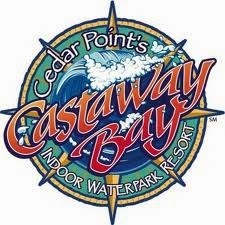 Castaway Bay is located at 2001 Cleveland Rd W, Sandusky, OH 44870. If you would like to learn more about them, be sure to visit Castaway Bay's Website. You can also keep up to date on special offers and promotions by following them on Facebook. *Disclosure: I received family passes and an overnight stay to facilitate this review. However, all opinions are my own and have not been influenced by promotional items. We go to Sandusky all the time but haven't been here. I think the next time we go, we'll give this a whirl (haha, pun intended). I'm glad you had fun!! And boo to the snow! Seems like you had great fun there! Moms are usually the ones behind the camera, but my husband did get 1 shot of me falling off the rope walk. I didn't feel the need to humiliate myself with that shot though lol. That looks ah-mazing. We have an indoor water park here in MA, but this one looks much nicer. If I ever find myself out that way, I would totally take the kids. Nice! 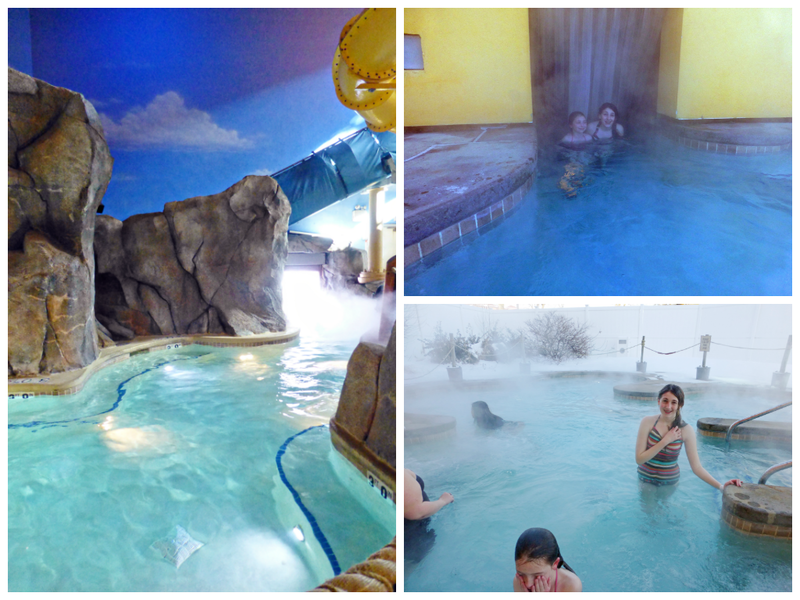 I would have liked to go to Kalahari while I was in Ohio this past holiday, but it was too much $$$. This looks like a lot of fun, and what I would considered a nice fun water park. Wow that looks like a ton of fun, we have nothing like that near here. A great way to forget about all the crummy snow about. I have always wanted to go to an indoor water park like this one! How cool! That looks like so much fun. Going to an indoor water park has been on my wish list for ages! I wish this one was closer to me. This look so awesome! I used to go to Cedar Point every summer when I was a kid. I miss it. Funny pictures , yes, I like to see the girls having a good time , nice shots ! Our entire family would have a blast there! It looks like so much fun. Your pictures are great! Love the one of your daughter on Rendezvous Run--that's such a kid favorite. Now that's a great escape. Looks like you guys had a beachy time! I will freely admit to being jealous right now. That looks like so much fun! I want to go! Wow! Looks you had a lot of fun. I really love all kinds of water parks. Wish I could visit the Castaway Bay one day! Looks like a lot of fun. The kids can use some indoor play in this weather. There's so much to do there. That rope bridge looks like a blast and so does the wave pool! You've convinced me! My bags are packed and I'm ready to come splash around! I can just see what a fun filled day the girls had. I don't live all that far from there..... I want to go too. How awesome!!! I would love to go.. and I'm sure Lil Pumpkin would enjoy it too :) What a great family place! That looks like so much fun, a water park in winter and you do not freeze - I love it. We are in Florida though so it has not gotten overly cold here yet. woow..cool pools ..lots of choices and it must be fun! and I loveee to see the snack shack!.purpleeee :D.. This looks like so much fun. With it being so cold in the East I would love to do this with my granddaughter. This looks like the best family place to go to . I want to take my boys! Looks like you had a wonderful time with your family. oh what fun!! Winter has been such a drag this year! I wish I could escape to a place like castawaybay. That is an amazing indoor water park. I can see where kids would love to vacation there and want to go back again. Looks like your family had a wonderful time. Too bad I don't live close enough to go there-I have no kids but that hot tub is calling my name--it is snowing out there again right now. I have never been in a wave pool and would love to try it. I've seen so many reviews of indoor water parks this winter, and they're making me sooooo jealous. Dude that looks like TOO MUCH FUN! Cedar Point looks so awesome. I would love to go there on day! So much to do! Its awesome to get away for a great vacation and to such a beautiful spot too. I love your photos and would love to get away myself. This looks like such a fun place. It would be great to get away from this snow. Oh my goodness. That looks like such a great place to go! Castaway Bay definitely looks like a lot of fun! I wouldn't have wanted to get out of the hot tub area, either! I am so tired of this cold and snowy weather we've been having! From BabsProjects: Vow that looks like an awesome water park. My girls would enjoy it. I wish it was closer to us. I would love to go to an indoor water park right now! That looks like too much fun! Looks like a lot of fun! I need to take my kids to an indoor water park! So close, yet so far away. How have we never been there before? I guess I didn't realize Cedar Point had a place like this. It sure would be nice to escape the cold. It looks like great fun. They look like they had a blast. I know my boys would love it! We don't live all that far from here so will be taking our Grandkids at some point. I bought Cedar Point season passes for the family this past Christmas, I'm tired of buying toys they don't play with, and plan to spend some time at Castaway Bay. The wave pool looks like a ton of fun but I think my kids would love hanging out in the hot tub! This looks like such a fun day for a family. I really want to try that water slide with the big yellow raft. This looks like the perfect winter getaway! I am looking for things to do over spring break! Castaway bay, what a way to spend your day. This place looks like an amazing vacation spot! That looks like a great escape from all this snow and cold! i think even my three year old is dreaming of the sun. he keeps asking for summer activities like the zoo and swimming. this would be great for him. I haven't been here before but I know my son would love it. I know i would! That Hot Tub is calling my name! My boys would love to swim and play the arcade here. My son will love it for sure! Awesome pictures, Theresa!